Free Wi-Fi kitchenettes and an indoor pool welcome guests at Studio 6 Vernal. This three-story hotel offers 76 bright rooms with flat-panel TVs iPod docks and kitchenettes complete with stovetops coffeemakers microwaves full-size refrigerators and dining and cooking utensils. Non-smoking rooms are available. 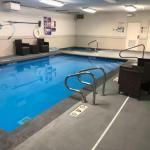 Splash around in the indoor heated pool and relax in a hot tub. Vending machines and guest laundry facilities are available. Pets are welcome for a fee and parking is free. Less than a mile from Vernal Regional Airport this hotel is about two miles from both downtown and the Utah Field House of Natural History Museum. Get closer to nature at Ashley National Forest about an hour away or go fishing at the Steinaker Reservoir. Dinosaur National Monument is about half-an-hour away. Flaming Gorge Dam is about 40 minutes north.